Miss Marple | Notes from the U.K. But for you non-Brits out there, the point is this: Britain’s a real place and part of the same world you live in. That’s another way of saying that it does have crime, and none of it is fun if you’re on the receiving end. Even the petty stuff can feel big. In contrast to the U.S., though, very little of it involves guns. They’re tightly regulated. People who want to get lethal are more likely to pick up a knife, but even so, things can get ugly. I’m not going to tell you about that, though. I live in a village of some 600 people and I’m going to tell you about what Miss Marple would have to content herself with if she lived next door. A few years ago, two men went into the village store in balaclavas. 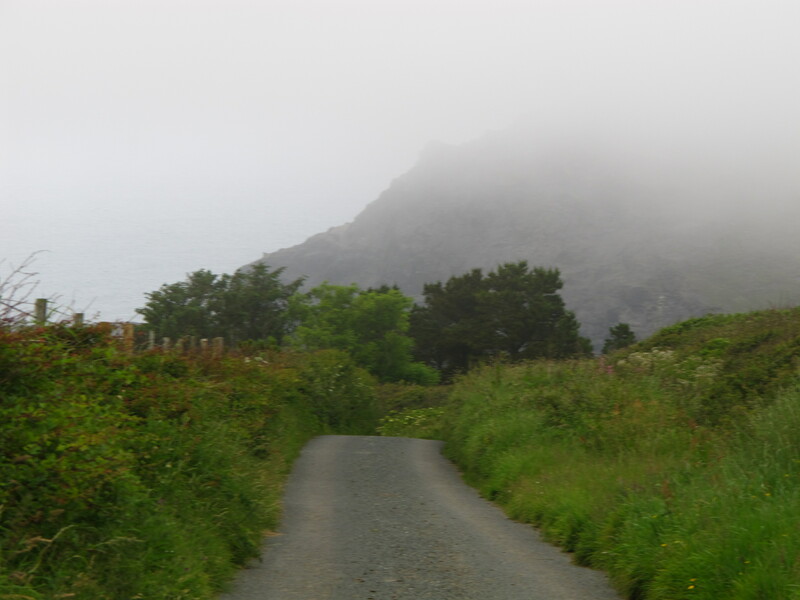 Even in winter the Cornish weather isn’t balaclava-level cold, but that doesn’t really matter since it wasn’t winter. They made the guys stand out a bit. S. was the only person working there at the time, and when they pulled out a knife and demanded the money in the cash register, she gave it to them. Two of them plus a knife, and one of her? I’d do the same. Then they demanded the money from the post office, which is part of the store but separated by a lockable door and glassed-in window. Now, the post office in Britain doesn’t just sell stamps. You can start a savings account there. You can buy travel insurance, or foreign currency. You can pay some of your bills. So you might expect it to have a bit of cash. But the village post office is closed on Wednesday afternoons, and this was a Wednesday afternoon. And they said, “Oh,” and left. They drove out of the village still wearing their balaclavas and were arrested before they got to the main road. All the police had to do was look for two guys in balaclavas, but in case that got too complicated one of the store’s owners followed them in his own car. Wild Thing thinks they should be grateful to have been arrested. They weren’t cut out for a life of crime. A few years before we got here, someone tried to smuggle in drugs (I’m not sure what kind, but if I had to guess I’d say cocaine) from a boat. If you don’t live here, you could convince yourself that with all these empty beaches and fields nobody would notice a thing. You’d be wrong. Apparently the police already knew about the plan beforehand, but if they hadn’t somebody would have noticed. Whether they’d have called the police I don’t know, but someone would have seen them. Fast forward to the era of cell phones–or mobile phones, if you prefer–and phone boxes aren’t making money anymore. BT’s getting rid of them anywhere it can. And then someone sets this one of fire. BT left it in place for a while, fulfilling the letter of the agreement, then they carted it away and H. didn’t protest. Wild Thing suspects they paid someone to burn it down. Me, I doubt they’d invest the money, but whoever did it hasn’t been caught. In fact, I never heard any rumors about who it might have been. Which in this village is highly suspicious. We used to have eggs for sale in several places along the road. They were free range, fresh (or as A. puts is, “Still warm from the hen”), and cheaper than in the supermarket. Plus the money went directly into the farmer or smallholder’s pocket instead of the supermarket’s. Then someone started stealing the money and eggs. Now most of the egg boxes are gone. I’ve heard lots of speculation about who it might’ve been—a visitor? someone local?—but no one seems to know. There’ve been two loud dances, which escalated to property destruction (a toilet paper holder was broken) and people harassing the sheep in the nearby field. I can testify that they were loud. Wild Thing and I went to one but stayed outside because it was too painful to be in the room with the band. The rest is hearsay. We left before the party had really gotten going and already people were peeing in the hedges. I don’t know—maybe that’s just part of a good night out. On a public level, that’s pretty much it unless you count some property destruction. Or rumored property destruction. Stories have a tendency to change shape as they circulate, so I won’t present this one as fact. We also have some drug use. Or reliably rumored drug use. Sorry, but I stopped doing first-hand research into that years ago. How much is some? Quite a bit. Doesn’t that sound like a more accurate measure, even if it isn’t? No one’s been arrested, so I’m not sure it counts in the crime statistics. A couple of people have been arrested for drunk driving. And I’ve heard about a theft that apparently involved someone settling an old score. But no one involved the police in that. We’re off the beaten track here. You have to work at it if you want to get arrested. A couple of years ago, a police car parked on our corner every so often and sat there for ten or fifteen minutes, then drove off. And no, the cop was looking away from our house. In fact, he was barely looking at anything. He did a pretty good impression of someone hiding from a job he liked even less than killing time inside a parked car. The rumor was that it was a community policing effort, although I’d have thought getting out of the car would have made it more effective. Anyway, that lasted a couple of weeks, then he stopped coming. And then there’s private crime—the kind that happens behind closed doors, within families, and isn’t remotely amusing. Once in a great while these spill into the street and get noisy enough to wake the neighbors. Some of us wonder who it was and eventually someone tells us. The fine art of gossip is alive and well here. Mostly I’d guess that whatever happens inside doesn’t get heard. That kind of crime is as common here as it is in cities, I’m sure, and as unlikely to be known about by outsiders. We did find out about the guy who was arrested for trying to kill his wife with a knife, but there was no mystery involved. The police came, and the papers ran a story. It wasn’t good for much more than a paragraph. It’s by far the most serious crime I’ve mentioned, but I’ve dumped it here under Other stuff because it’s not funny. Still, some of us—including me—watched the papers for details. It’s horrible, that fascination, and I indulged as much as anyone else. Miss Marple knew how to harness it, but the rest of us? We just pass the tales back and forth and shake our heads. J. works with a women’s center that deals with sexual violence, putting her head-shaking to good use, but all I do is write the occasional blog post. The next morning Wild Thing told me the exact time it happened, but it involved numbers so I promptly forgot. It’s all very suspicious. And you heard it here first. I’m sure Miss Marple would agree: There are no secrets in the village. But there’s a lot of misinformation, and if you want to unravel a story, that’s where you start. Wild Thing and I worked on the village newsletter for a while. Then we stopped and the newsletter continued on. Long story there and not one I’m going to tell (sorry), but I mention it because we got a letter last week addressed not to either of us but to the newsletter’s secretary—no name, just the title—with no street address and a post code that would land you somewhere in the village but not at our house, or even close to it. And it reached us. Because we used to get mail for the newsletter, and because the letter carrier remembered that. 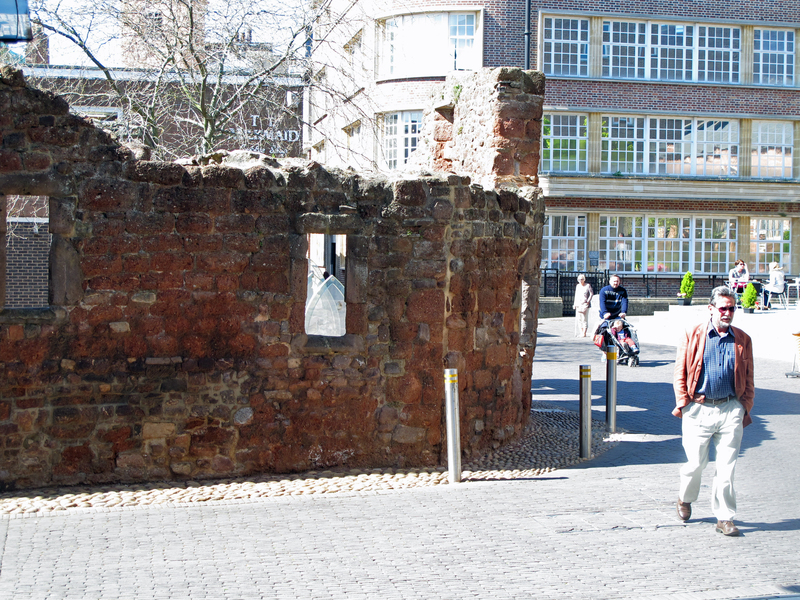 Remains of a church, destroyed in the bombing of Exeter city center, now preserved as a monument. I took the letter to M. She’s not the newsletter’s secretary, but then neither is anyone else. It works just fine without one. She does work on the newsletter and part of her job, at least when I was still involved, was to type up announcements that come in on handwritten scraps of paper, so it more or less made sense to choose her. Here was a handwritten bit of paper. Not a minute’s walk from our house was M. So I rang her bell and handed her the envelope. “You didn’t open it,” she said. I hadn’t. Not because I’m virtuous (although, oh, I am; painfully so; if I didn’t swear so much, I’d float a good six inches off the ground) but because I hadn’t been curious about it. Mostly—let’s be honest here—the newsletter’s pretty dull. Suddenly, though, I did care. We were holding a secret and we were inside the village. We were two bad kids, about to be find out something that was none of our business. Except that it was, but let’s not argue, the feeling was delicious. She tore open the envelope. The letter turned out to be from a woman who’d been evacuated to the village during World War II, asking for information about someone she’d known. M., who’s much better than I am about knowing who’s related to who(m, if you insist), immediately started talking about who would know. And there I left it. She’ll make a few calls. People will ask around. The network will be activated. If nothing else works, the newsletter will run the letter. Maybe it’ll run it anyway, because other people will want to know about it, and it may trigger reminiscences of those times, and all of that is the job of a village newsletter. Of the nearby big cities, Plymouth was heavily bombed, and Exeter was bombed but not as heavily. Unlike Plymouth, it wasn’t targeted for its industrial or military importance, but for its cultural and historical interest, which no one had expected, and although children were evacuated from Plymouth (a predictable target), they’d been evacuated to Exeter, which must have seemed safe. The BBC has compiled a list of bombings in Cornwall and some memories of evacuees and others who lived in Cornwall during the war (and elsewhere in the country, but the link will take you to the Cornwall pages). The memories especially are worth a look.